In spring 2011, the program is invited to show in Beijing after being selected Work of Excellence – Theatre Arts, Guangdong. In the meantime, Liu Qi has further developed the work from a 43 minutes work to a full evening program of approximately 70 minutes in length. 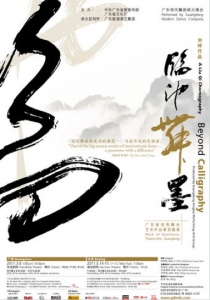 The new production, collaborating with composer Li Chin Sung and luminal art designers Leo Cheung, Roy Szeto and Billy Tang, is named Beyond Calligraphy. The first part of the piece retains the dance structure of the Calligraphy representations while a new epilogue is added, which pays homage to the spiritual essence of ink wash painting. The linear logic of development in the original work, which comments on the cold, emotionless mode of communication in the digital era, is resolved in the balance and harmony between the water and ink.